Cycling & Track Racing, Vegan-Style! : Happy Happy, Joy Joy! Overall, it's been a good post-Trackfest week! Monday, went out to the track to help organize the sprints..rain. Tuesday, considered the TT, but the weather was crap, so didn't ride. Took an extra rest-day on Wednesday. I also considered the VCL Crit, but had a GVVA meeting in the evening. Friday i chilled. Saturday was the Oak Bay group ride, and due to MORE RAIN, only about 10 peeps turned out (as opposed to ~50 that we've been seeing!) We got a decent ride in, despite the foul weather. Sunday was more of the same, tho lighter rain. I couldn't bear to ride in it, so i decided to spend an hour on the trainer instead, which was actually a really good idea. I've got to start logging tons of miles in the aero bars, and so hooked 'em up, and did a few long intervals in them, to start acclimatizing myself to them again. I went out fairly hard, got myself up to 49kph, then spent a couple laps coasting down..and accidently went too low - i got down to 41kph - oops! I was feeling really good, and picked it up to 43-44kph, and basically held that. I got a bunch of the other guys to start on the other side, so i wasn't riding all by myself...and i was getting pretty close. I was happy with how i was riding, so i eased up a bit with a few laps to go, and then gunned it for the last lap. Before i was even finished, i knew it was a success! I was holding 43-44kph, and it was relatively effortless!! Not only could i have easily smashed my own PB on the track that night, but i would have done it on a cool night. That felt really good. This means that i might be on track for hitting my goal of getting under 5:20 at the Provincials in August...fingers crossed! In other news, i've decided on my next bike! 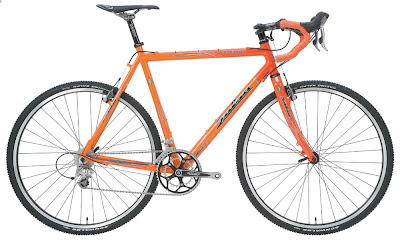 The good men over at OBB helped me pick out my future Cyclocross / winter bike! 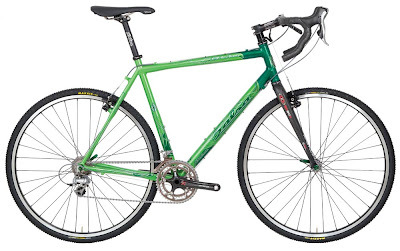 I'll be picking up a Salsa Chili Con Cross, a scandium race frame, that, of all things, comes in GREEN! It'll be light and comfortable - music to my ears. Before i start dumping cash into this, i still need to get an aero helmet.. Any suggestions on where to find a good price on the Bell models? hey man, if your looking for tt helmets I have a pretty much unused LAS in blue. I bought it last year and am not allowed to wear it this year for sponsor reasons. It has 2 different shade visors with it a yellow and a dark. Retail is like 175 bucks I believe. Something New - A Poll!